Concerned about aspects of her romantic relationships, Donna McDonald consulted with a psychologist who asked, “Your hearing loss must have had a big impact on you?” At age 45, with a successful career in social work policy, McDonald took umbrage at the question. Then, she realized that she never had addressed the personal barrier she had constructed between her deaf-self and her hearing persona. In The Art of Being Deaf, she describes her long, arduous pursuit of finding out exactly who she was. Born in 1950s Australia, McDonald was placed in an oral deaf school when she was five. There, she was trained to communicate only in spoken English. Afterwards, she attended mainstream schools where she excelled with speechreading and hard work. Her determination led to achievements that proved her to be “the deaf girl that had made good.” Yet, despite her constant focus on fitting in the hearing world, McDonald soon realized that she missed her deaf schoolmates and desired to explore her closed-off feelings about being deaf. 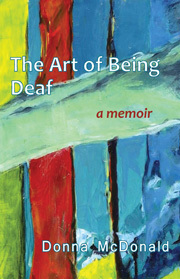 When she reconnected with her friends, one urged her to write about her experiences to tell all about “the Forgotten Generation, the orally-raised deaf kids that no one wants to talk about.” In writing her memoir, McDonald did learn to reconcile her deaf-self with her “hearing-deaf” persona, and she realized that the art of being deaf is the art of life, the art of love. Donna McDonald is a senior lecturer and convener in the Disability Studies Program in the School of Human Services and Social Work at Griffith University in Meadowbrook, Queensland, Australia.